During the next couple of weeks you can pre-order the "20 Years Strong | River Runs Red: Live In Brussels" release with an exclusive "20 Years Strong" t-shirt for only 19.99. 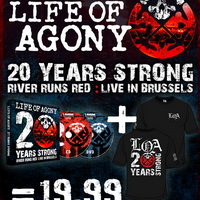 A beautiful digipak package, with foldout poster, holding a full length CD and DVD of Life Of Agony's 20th anniversary performance in Brussels, Belgium. The DVD also features bonus material and the "20 Years Strong" documentary.This is a limited and exclusive offer so take advantage of this great opportunity today. Place your order here. Pre-order ends on July 9th in Europe and July 16th in the rest of the world.